Oh yeah. 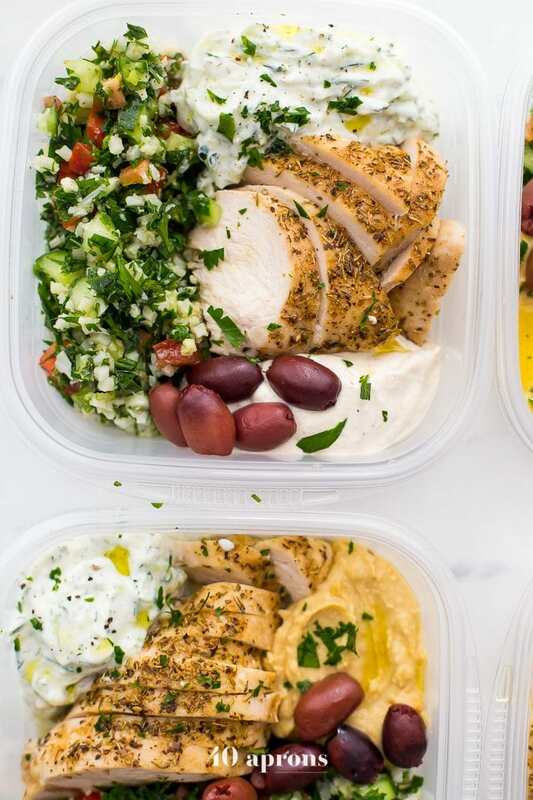 These Greek healthy meal prep bowls. Y’all. Yallyallyall. YALL. If you’ve been reading the blog for very long, you know that eloquence deserts me when I’m especially excited about a dish. 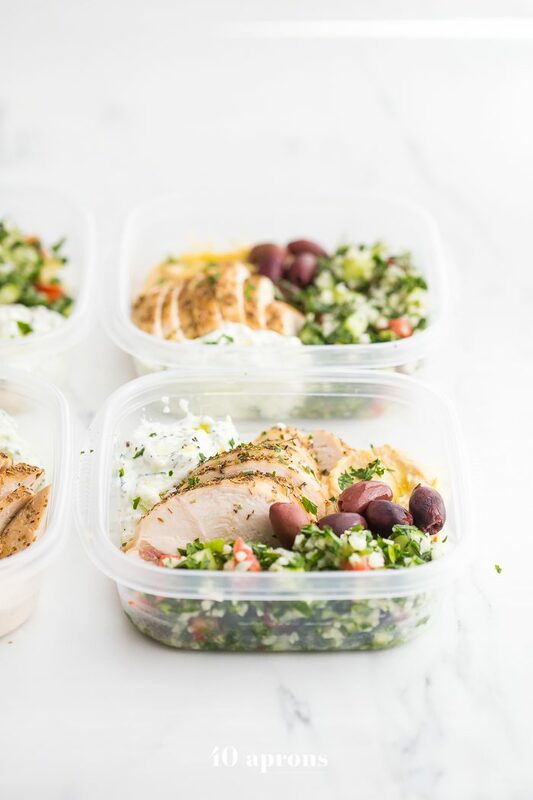 And this recipe, these Greek healthy meal prep bowls, they totally qualify. You see, I posted a photo months and months ago when we still lived in our old house in town with the pockmarked marble countertops and the mint cabinets, the canopied backyard and poorly lit makeshift dining room that I used as my studio. This Greek goddess bowl layered quinoa with a quick parsley, tomato, cucumber tabbouleh, hummus, grilled chicken, kalamata olives, and, the pièce de resistance, healthy fried artichoke hearts. This dish elicited such a passionate response when I posted a photo on social media that I was devastated when I lost the recipe, written in a fury on, certainly, a landscape company’s branded notepad or on the back of a takeout menu, in the move to our new house. But this week, as I’ve been transitioning slowly from a very strictly paleo diet to one based on simply whole foods, I decided to work on a new recipe for the Greek goddess bowl. And then it hit me… what about Greek healthy meal prep bowls, too? 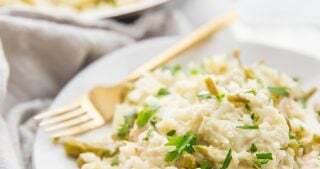 I wanted to make a grain-free Greek meal prep recipe that used cauliflower rice in tabbouleh, with either baba ganoush (for paleo or Whole30) or hummus, and with a galicky and tangy, herbaceous tzatziki sauce with the option to use coconut yogurt. And I couldn’t begin to explain the satisfaction I felt later that day with my bowls laid out, filled with fresh foods, heavy on the protein and the veggies, wondering if we could just skip dinner altogether and eat these on the couch, catching up on Twin Peaks: The Return. 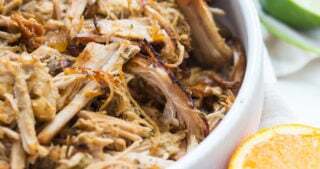 But no, I made carnitas instead, working on further perfecting my perfect Instant Pot carnitas recipe (adding beer is always a good idea! 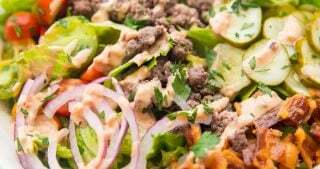 ), and dreamt all night, in between bites of impossibly tender, flavorful pork tenderloin, of the Greek healthy meal prep bowls waiting for me the next day. And, unlike so many fantasies, the reality was just as good, if not better, than I’d imagined. 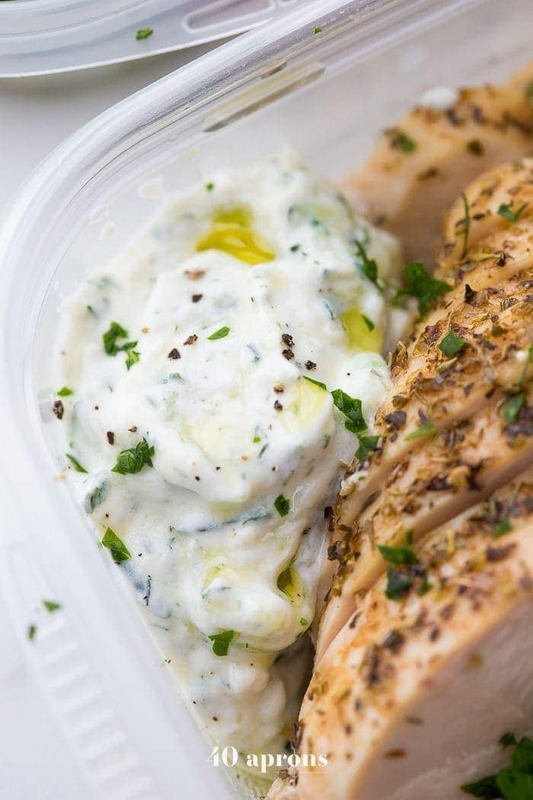 The rich and garlicky tzatziki spooned onto pieces of tender, flavorful chicken? Dead. A bite of the hummus-infused tabbouleh, with its bright parsley, lemon, and veggies, from the tabbouleh-hummus border? Dead. 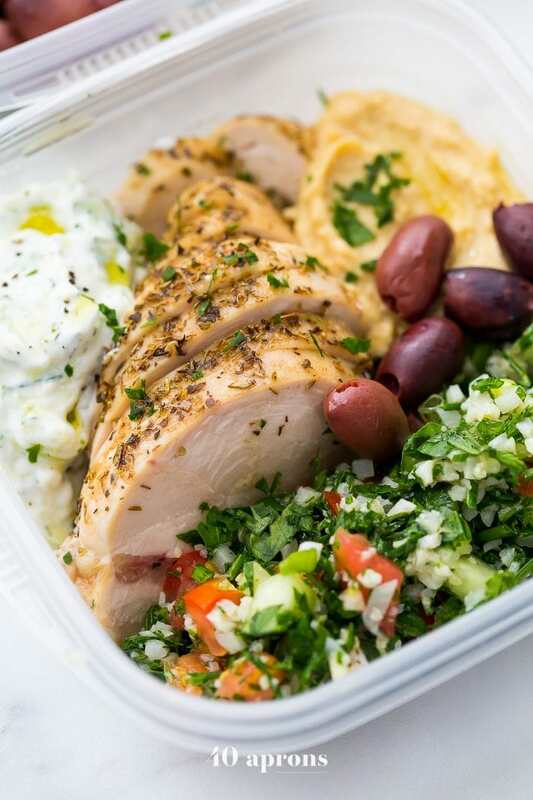 A briny kalamata olive on top of the rich and garlicky tzatziki spooned onto pieces of tender, flavorful chicken on top of a bite of the hummus-infused tabbouleh with its bright parsley, lemon, and veggies, from the tabbouleh-hummus border? Dead dead dead. I had approximately little deaths during the duration of this lunch. And yes, I might be a little out of control with this innuendo today, but I’m feeling damn amorous over these Greek healthy meal prep bowls. OK, also, can we talk about the Whole30? If you’ve ever done one, you know how amazing you feel but how much your feet hurt. From standing up cooking, like, all the time. So much cooking… so much. 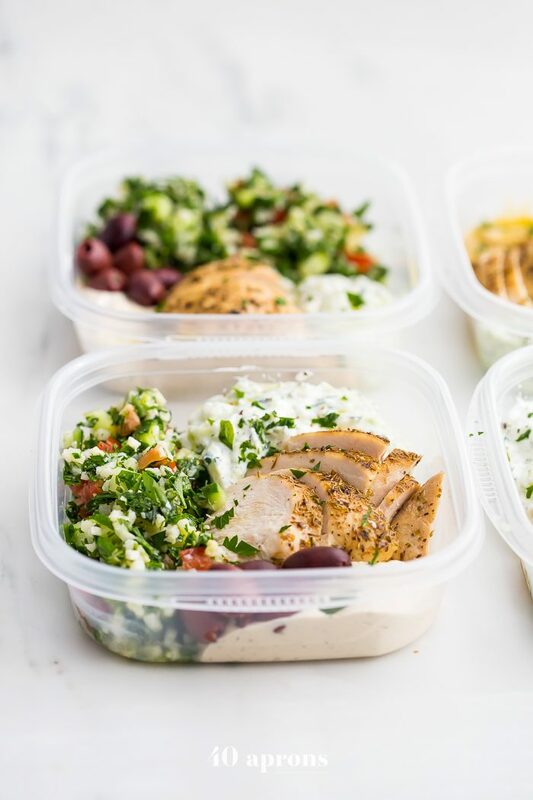 These Greek healthy meal prep bowls are totally Whole30-compliant, so long as you use compliant baba ganoush (my baba ganoush recipe is perfection) make sure to use a compliant coconut yogurt. I’m also including my recipe for a totally Whole30 coconut cream tzatziki, which requires no funky ingredients! It does taste a bit coconutty, but it’s pretty mild and still totally delicious. 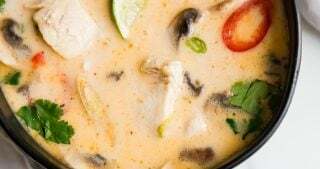 Or make your own coconut yogurt with an Instant Pot and this recipe. Same deal for a strict paleo diet. Oh, and you’ll want to stock up on meal prep containers. These are perfect: a great size and glass, too! Or try these more economical BPA-free meal prep containers; they hold the same volume and are super easy to throw in your work bag or lunchbox. 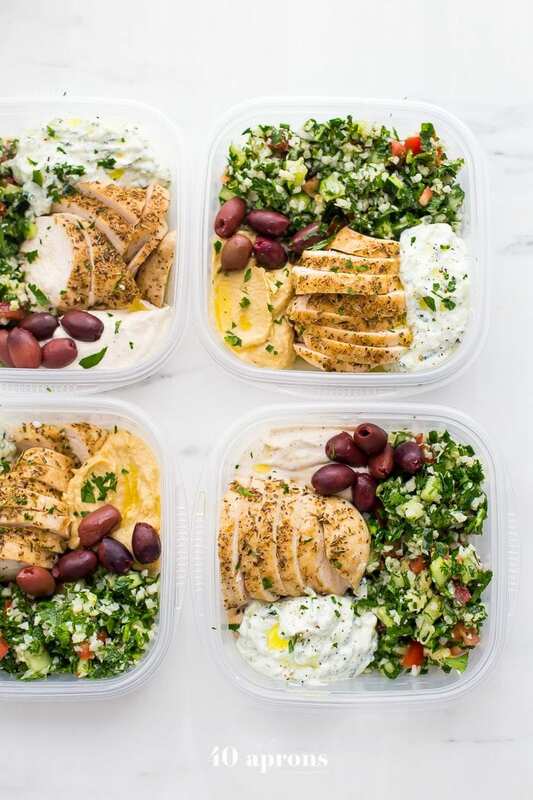 This Greek healthy meal prep recipe is epic: cauliflower rice tabbouleh, tender seasoned chicken breasts, hummus or baba ganoush, kalamata olives, and a rich, garlicky tzatziki. 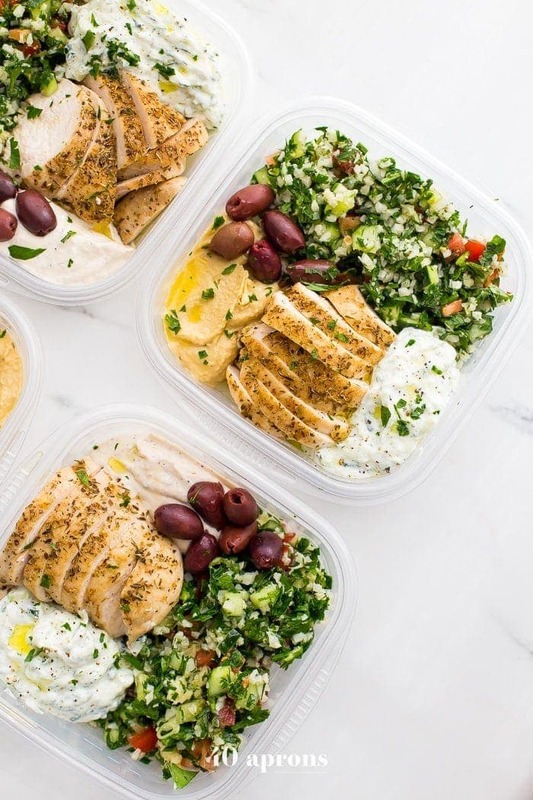 This healthy meal prep recipe will have you looking forward to lunch all morning! 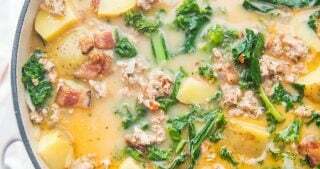 It's also a Whole30 meal prep recipe and paleo meal prep recipe, too, when you sub coconut cream or coconut yogurt for the yogurt. This is seriously SUCH a perfect healthy meal prep recipe. Place grated cucumber (for tzatziki) on a paper towel and gather edges together. Gently squeeze the bundle to get rid of as much liquid as possible, then place on top of a sieve or colander while you prep the remaining items to allow the cucumber to continue to drain. When cucumber has totally drained, stir together all tzatziki ingredients. Season with additional salt, to taste. Preheat oven to 400º F. Combine all herbs, spices, and salt in a small bowl. Brush both sides of chicken breasts with olive oil and sprinkle generously with herb mixture. Bake until meat thermometer reads 160º F, about 25-28 minutes for pretty thick breasts. Don't overcook! Remove from oven and set aside to fully cool. Combine all ingredients and season with additional salt, to taste. Slice chicken breasts into about 1/2" slices against the grain. Divide slices equally among 5 meal prep containers. 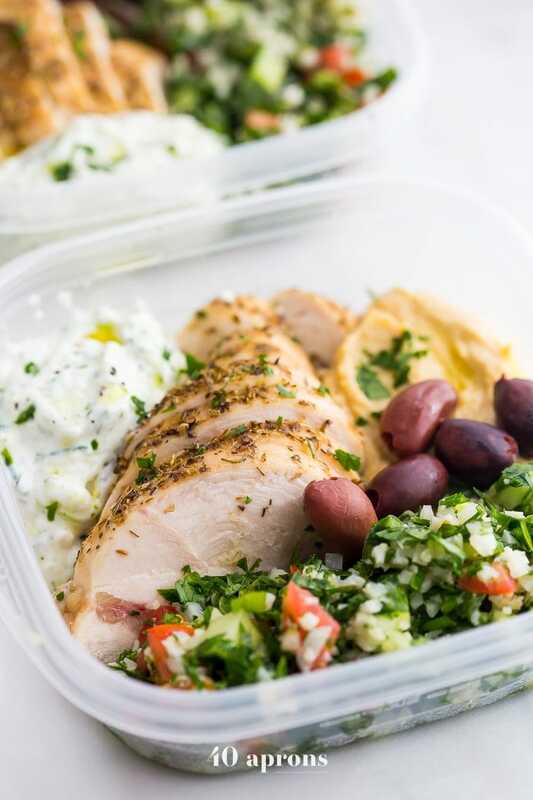 Divide tabbouleh and tzatziki equally among meal prep containers, as well. Spoon about 2-3 tablespoons hummus or baba ganoush into each container, to taste, and top with about 5 kalamata olives. Garnish with crumbled feta, if desired, chopped fresh parsley, a light drizzle of olive oil, or freshly cracked black pepper. This Whole30 tzatziki is so flavorful and totally dairy free. 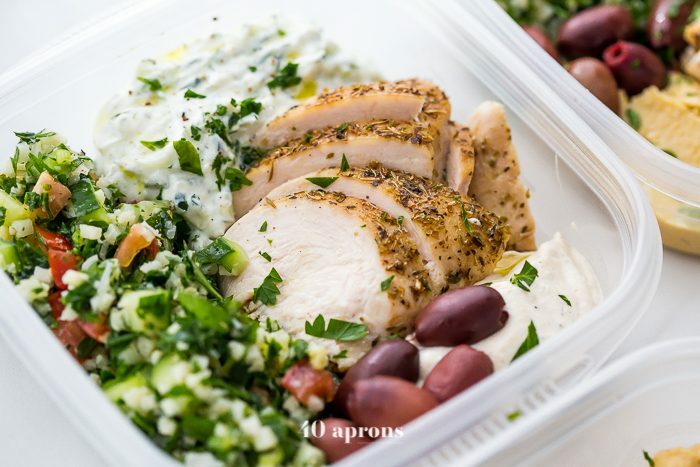 Perfect on chicken and in our Greek healthy meal prep recipe! Combine all ingredients in bowl, adding cucumber, and stir until well combined. Season with salt to taste and garnish with chopped fresh parsley. 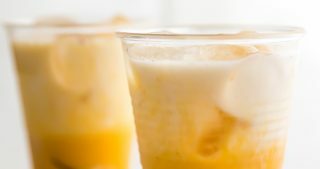 I am allergic to cauliflower, and I know this makes a difference in the recipe and the calories, but is there anything else you can use. I also can’t do spicy because of stomach problems. HELP!!! You can substitute 12 ounces of cooked cracked wheat bulgur in place of the cauliflower rice, which will give you a traditional tabbouleh. Simply leave out the crushed red pepper, too! 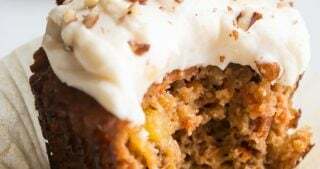 This recipe is so delish and easy to make. I’m loving it!! Yaaaaa… I like, never, leave comments on the recipes I cook from various websites (and I’ve cooked many in my time) but …. this was delicious. I’m eating it now and I’m in heaven. Yum!! Looks amazing! But you also caught my eye at fried artichoke hearts. Will you be redoing and posting that recipe? Absolutely! I really need to do that soon – it’s SO good! I’m so so glad you liked it Cheri! Did you use fresh or frozen cauliflower rice? I’d love to make a note in the recipe about your method if you used fresh! Hello! 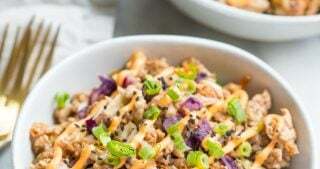 If I want to make fresh cauliflower rice how much should I make? I don’t know how much comes in a bag. Thanks! What is the tzatziki and hummus for? 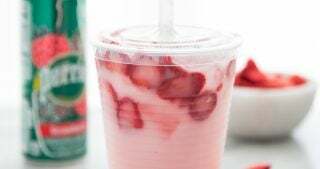 Looks super yummy!!! I like to tip the chicken in either sauce to amp up its flavor or stir it into the tabbouleh! 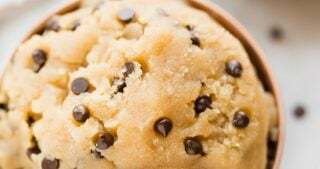 Do you know how many calories are in 1 serving? This looks delicious! Do you need to cook the cauliflower rice first though?? Nope! It’s great right out of the bag thawed.